Engines: 1 x Perkins P4 @ 47hp. Speed: About 20K, with 5 up. 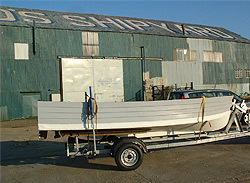 FMD5004, a 16ft Fast Motor Dinghy, was delivered by road to the PNBPT on the 9th July 2009. 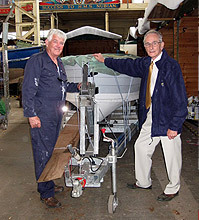 Brian Patterson was on hand to receive the boat from Richard Hellyer. 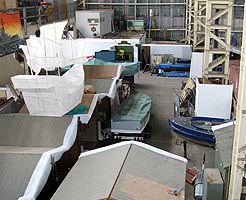 FMD5004 served on the Daring class destroyer HMS Dainty, and on retirement from the ship, was allocated to serve in the Portsmouth Dockyard for many years. 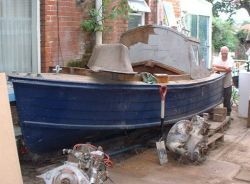 Retired from the Royal Navy, she went into private ownership, before being offered to the BMPT. 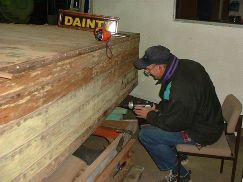 She has been partly restored. 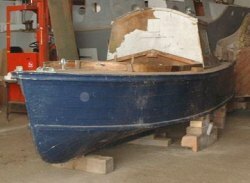 It is hoped that her restoration can be continued in Portsmouth. 5004 was the 3rd of four craft built by Woodnutts, Isle of Wight and was completed 26.4.51 for HMS DAINTY, one of the "Daring" class. HMS Dainty, was built by J.S.White and launched 16th August 1950 and scrapped 1972. Ships Reserve Portsmouth in 1958. 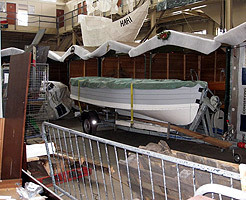 Selected for issue to Portland Naval base and transferred to the Port Auxiliary Service for use by the Chief Engineer in lieu of 16ft FMB 42136. Removed from Port Auxiliary Service account on 6.2.62 and then at Portsmouth for consideration for Ministry of Education 28.5.62. 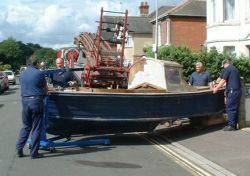 19.5.67 sold to Fred Watts, Gosport well known scrap yard and boat dealer and removed from base 12.7.67. 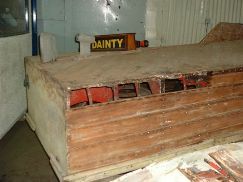 Above: The beginning of the 5004 restoration programme, December 2004.